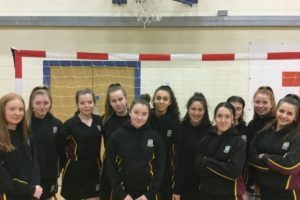 Year 10 girls competed in the Preston schools’ handball competition held at Preston’s college on Wednesday. The girls finished third overall. They lost 2-0 to Archbishop Temple but won all of their other matches in the round robin tournament. However, the team ended up in joint second place with St. Cecilia’s and ended up in a play-off. The game finished 0-0 and consequently went to golden goals. St. Cecilia’s were the first to score and won the game. It was a great effort by the whole squad and the girls gained lots of experience from the matches.